I stumbled across a Count Chocula commercial (1991-ish) called “Mickey” and I had to talk about it. It’s notable because A) it features a live-action Count Chocula and 2) well, watch for yourself. Klondike Pete’s Crunchy Nuggets came in both a “wheat cereal” and “rice cereal” variety. The cereal’s mascot, Klondike Pete, was a bearded prospector who searched for gold with a mule named Thorndike. The cereals began as Ranger Joe Rice Honnies and Ranger Joe Wheat Honnies in 1939. The National Biscuit Company (later known as Nabisco) bought the Ranger Joe cereals in 1954 and changed their names to Rice Honeys and Wheat Honeys. In the late 1960’s, sales of the Honeys cereals began to sag. In 1971, in an attempt to revive the cereals, the names were changed again, this time to Winnie-The-Pooh Great Honey Crunchers, which came in both rice and wheat varieties. Despite a barrage of marketing centered around the Winnie-The-Pooh character, the cereals’ sales continued to disappoint. Nabisco give the cereals one last shot. About a year after the Pooh incarnations were introduced, the cereal changed names for the last time, this time to Klondike Pete’s Crunchy Nuggets, rice and wheat. 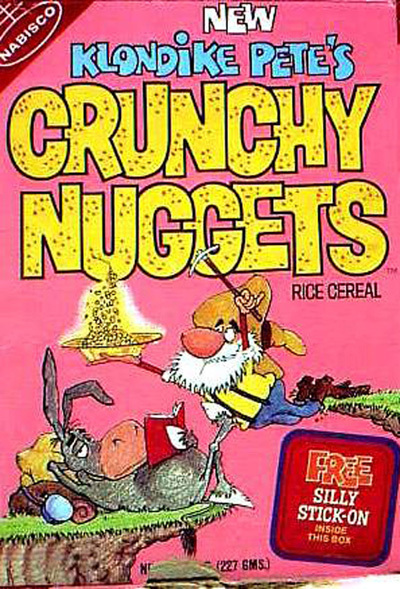 In 1975, Klondike Pete’s Crunchy Nuggets was discontinued and the cereal that had existed under one name or another for 36 years was finally gone. Ah, Ralston. 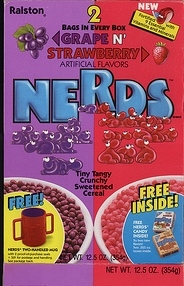 The undisputed masters of cheaply-made licensed cereal. Just like Ralston’s later Nintendo brand of cereals, you get two bags in one cereal box. Which side are you gonna eat first? I would say just imagine Trix cereal focusing on two flavors instead of five or six but these are supposed to be… tangy? Um, I don’t know if I want my breakfast cereal to be tangy. 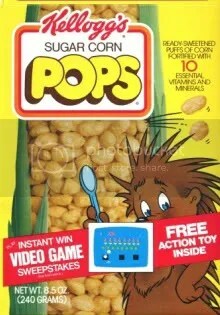 Kellogg’s Corn Pops: 1951 – 2012..? An interesting article was posted this past summer at 24/7 Wall St. about brands that are projected to disappear in 2012. Sears, Sony Pictures, Nokia and MySpace are on the list but on a more serious note Kellogg’s Corn Pops made the list as well. 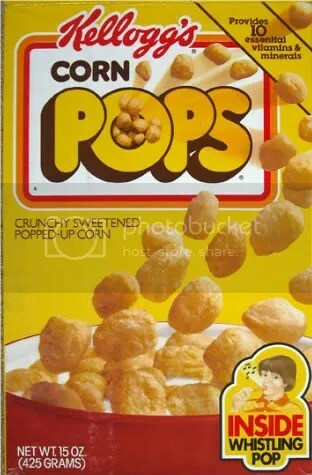 Debuting in 1951 as “Sugar Pops”, the cereal was re-titled “Sugar Corn Pops” in the late 1970s before finally settling on “Corn Pops” in the 1980s. 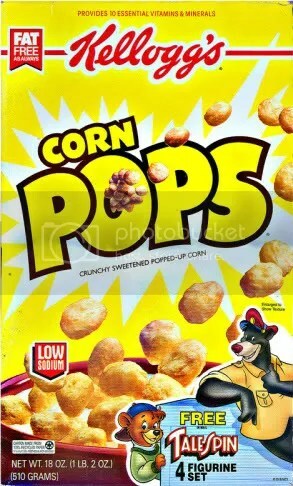 I remember a few years back they changed the name yet again, this time simply to “Pops” (which I always found strange). Luckily, the cereal was restored to “Corn Pops” after only a few months. 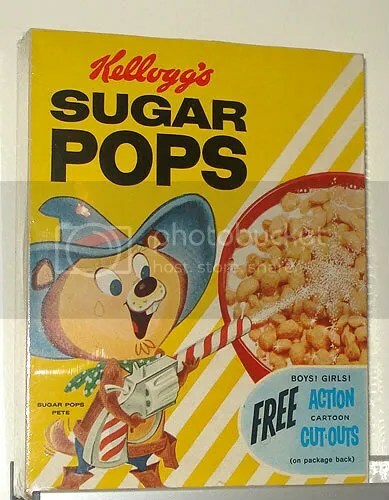 Surprisingly, in the United States alone the cereal had a number of mascots over the years: Woody Woodpecker, Newt the Gnu, Sugar Pops Pete (a prairie dog cowboy), Whippersnapper (a cowboy), Big Yella (another cowboy) Poppy (a female porcupine) and most recently Sweet Toothasaur. Poppy was a mascot during the ’80s yet I have no recollection of her or anything of these other mascots. I can only remember tag-lines such as “Gotta have my Pops!” and “It’s hard to stop when it’s my Pops!” and the use of the JAWS theme in the commercials. 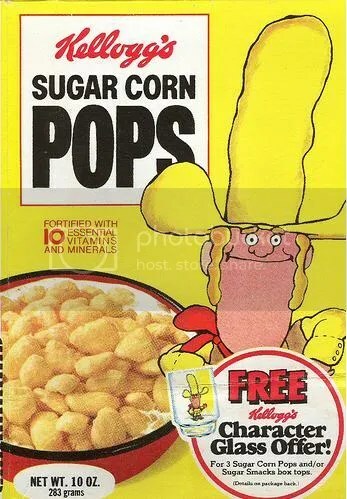 So what’s the reason Corn Pops is in mortal danger? Well, sales are down because people are looking towards healthier cereals and when you’re using BHT (something found in embalming fluid) as an ingredient you can’t really claim to be all that good for anyone to eat. Never mind the fact that everyone knows Corn Pops are covered in sticky, sweet sugary glaze. Falling sales are only half of it though. The price of corn is on the rise and that makes it harder for this brand to turn a profit. Truthfully, there was nothing in the article that said Corn Pops was definitely going extinct. All the article was saying was that the brand was having a hard time and they were suggesting it’d be a wrap in 2012. 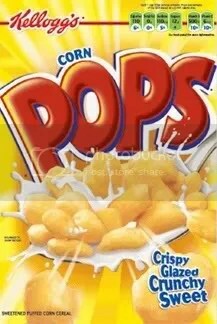 Although I don’t eat Corn Pops as much as I did when I was a kid, I still get cravings for it and pick up a box every few months. It’d be a shame to think I could no longer do so come 2012. So here’s to ya, Corn Pops. I tip my cereal bowl to you and I hope you can somehow find a way to soldier on in a world of raising costs and where people are choosier about what they consume. Here is a K-Mart commercial from 1986. God, I miss the glory days of K-Mart. You see at the end where it says “America’s Favorite Store”? That’s not just the marketing department talking, that’s legit! Or at least, for that point in time it was. Any K-Mart I’ve seen in the last 1o 0r 15 years seems to have it pretty rough but the ’80s were a great time to be K-Mart and to shop at K-Mart. I loved that place. It’s a part of my childhood. My town didn’t have Walmart until the early ’90s and didn’t get a Target until after that. We had three “big box” stores: Hills, Roses and K-Mart and you better believe K-Mart was the King Kong in that little group. Going to that K-Mart during the holidays was as wild an experience as it is going to a Target or Walmart today. This is CBS promo from 1987 for the beloved Bugs Bunny’s Looney Christmas Tales and Santabear’s High-Flying Adventure (which was premiering that year). I can’t recall ever hearing of Santabear but after a quick look at it on YouTube, that’s probably for good reason because it’s very offbeat and has lots of awkward silence. There’s not much in the way of background music. But, when you’ve cast John Malkovich as your Santa Claus, you’re probably going for offbeat & awkward in the first place. I mean, seriously, why was this guy at one point considered a great actor? He’s awful and/or hammy in every performance I’ve ever seen. Still, had my dad deemed it worthy of being recorded, I have to admit I probably would have grown up loving it. I’m not sure if it’s ever seen a video release or aired any time after 1987. Oh, and yes, there were be a review of Looney Christmas Tales coming later this month so that’s why I’m not saying much about it. Wow, you just don’t see any gasoline commercials anymore (I’d just love to see them try to toot their own horn in this day & age of insane gas prices). Certainly we haven’t seen any commercials featuring a name star with an amusing plot line in quite some time. The last (and only, really) fuel commercials I remember when I was growing up are the ones that boasted about how clean and environmentally friendly (?!?) their gasoline is. These early 1960s commercials, especially the first one, are pretty funny if you’re aware of the cheapskate character Jack Benny has portrayed as “himself” since the 1930s through radio and into television. Side note: Jack was against doing commercials like these and didn’t want to become a pitchman for products. He didn’t want to belittle himself and be seen as a huckster. It was during this time as his career in entertainment was starting to slow down a bit that his business manager convinced him it was a good financial opportunity though and so he went along with it. Even if he may not have enjoyed the job, I think he did a great job.